Today we went tree hunting at our local farm. Funny how we have made that place a regular stop for most of our holiday traditions. Summer berries on St. Jean Baptiste Holiday, Apples in the fall, pumpkins for Halloween, and a tree for Christmas. We've certainly gotten our money's worth from the annual family passes. This month at Scrap YOUrself challenge blog, we're all about those little family traditions we all hold so dear. Stop by and have a look at the beautiful creations from the design team. We unwrap new jammies and stories Christmas Eve as do many families. Not only do the new pajamas make for nice Christmas photos that night and next morning, We love winding up the excitement of the night with some quiet time reading together before bed. I know that sooner than later, those little boys will be too big to fit on my lap, and The Gingerbread Pirates and other loved stories will be a faded memory. Take the time to scrap your present or past Christmas traditions this month, and be sure to include yourself in the photos, so those memories can be passed on. Cute layout Erin!! Love the triangle Christmas tree! I give my kids new pj's on Christmas Eve too! Hi Erin, I love how you built that tree ! Just a gorgeous page ! 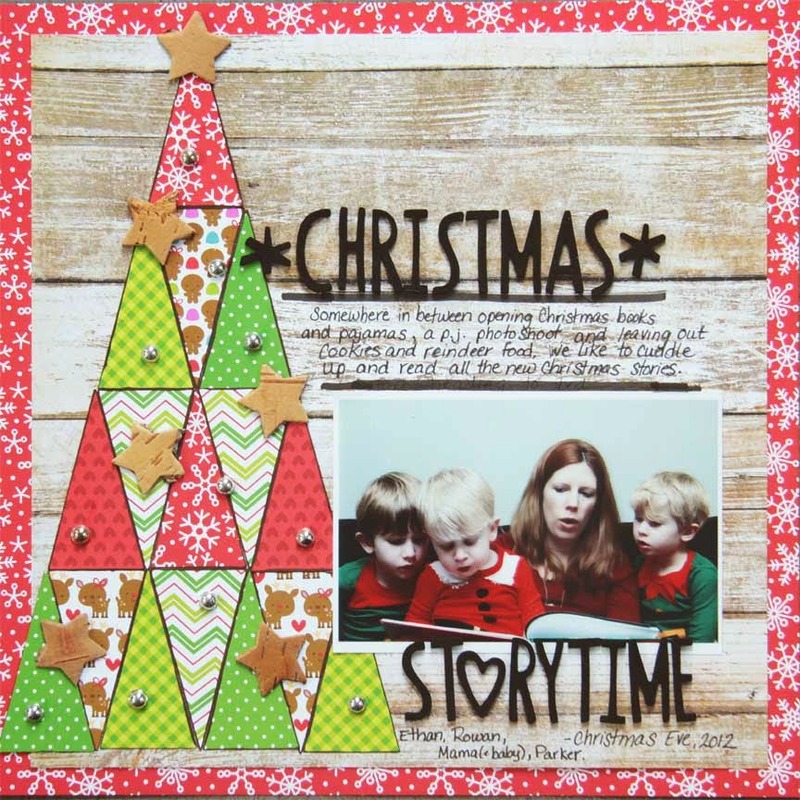 great Christmas layout! LOVE how you did the tree!